Turkey is generally a hard sell for me when I’m eating a sandwich at a restaurant. Deli-style sliced turkey is an even harder sell. It’s not my favorite meat, and I generally think that if I’m going to eat a turkey sandwich I may as well make it myself at home and save some money. I understand that turkey is a comparatively cheap, healthy option, but it doesn’t generally appeal to me outside of Thanksgiving. But I wanted to stop by Arby’s and see what was new, and I decided to give the flagship sandwich of their new Turkey Roasters line, the Grand Turkey Club, a shot. How grand! How perfectly grand!! It was surprisingly grand after all!! The hook of the Turkey Roasters is that they’re served hot, which is a nice step towards making a deli-sliced sandwich feel more like a proper meal. The Club is pretty standard, with bacon, swiss, tomato, lettuce and mayo on Arby’s wheat bun, but the high quality ingredients set it apart from the standard sub shop turkey sandwich, There’s not a whole lot to say beyond that; if you like turkey clubs, this is a great one. 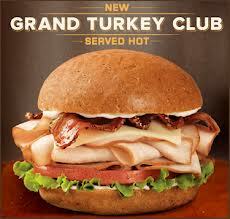 The Grand Turkey Club has melted my hard heart towards sliced turkey sandwiches, at least the ones from Arby’s. It’s definitely worth picking up.